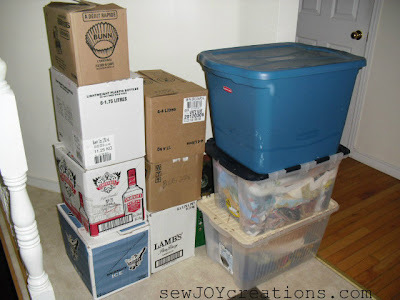 These boxes and totes are my quilting treasures ready to move back into our house. We will be spending at least another year in our present location. To make the best of things, I'm getting a bigger sewing space! 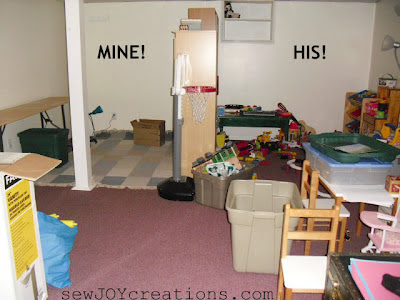 My husband suggested that I take over some of our son's play area in the basement. This is the natural division line I created with bookcases. Lots of his toys had been moved into totes over the summer to make cleaning up for open houses easier. I think we'll keep more put away than out for awhile and see how it goes. 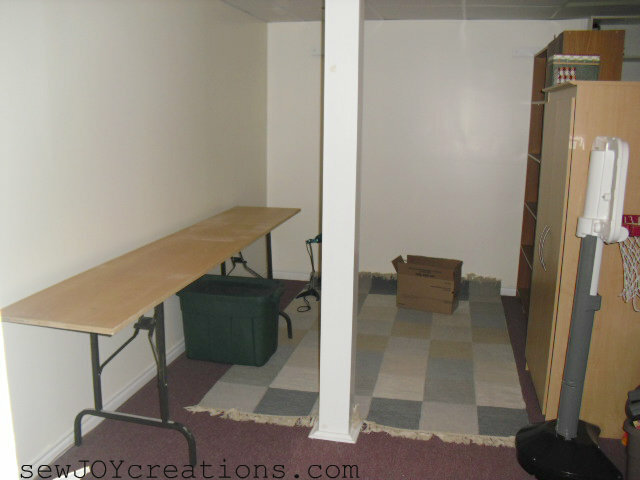 Here you can see it's bigger than the front entrance way I used to create in - and much larger than the space in the laundry room! Natural light is pretty much non-existent though. I will have to get some more lighting, but for right now I'm happy with my bigger space! My sis just moved and has her new space looking spiffy already. She has stuff up on the walls even - go check it out! You're lucky to have such a supportive hubby (take full advantage) and your sister also staying for a while! EnJOY the extra room!